Lovely hostel runned by lovely people! We experienced a perfect stay. It really feels like a home with a cosy living room. The owners also are very nice and willing to give any advice about the things you can do. We forgot our small lock in the room and when we realized that, were already in town. The owner brought it to us! Really kind! A place that immediatly feels like home ! Warm arrival by lovely people who run the hostel. As soon as I arrived, I booked an extra night. That's how great my first impression was. The location is perfect, the hostel is cosy and very clean, the beds are comfortable, hot shower available, from the balcony you have a magnificent view over the lagunes. The owners are pleased to help you out if you have any kind of question related to your travels. Truly the best hostel I've experienced so far! Ik had een privékamer gekozen in het appartement. Alles was hier top geregeld. Enorm behulpzaam personeel (eigenaar en eigenaresse). Beste host tijdens mijn vakantie van 4 weken in Colombia. 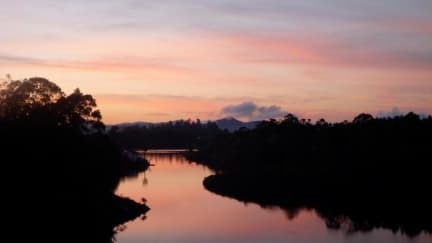 Een aanrader om een nacht in Guatape te overnachten. Even ontvluchten uit het drukke Medellin. We head a wonderful time at this hostel. Everyone was very friendly/helpful! Lovely stay when you want to visit the la Piedra rock in Guatape or the city. Really nice owners, everything is clean and compfortible beds. Busses and local transport just stops in front of the hostel, you can jump on whenever you want for just 2.000 peso’s and go to the city. Thanks for the pleasant stay! Super cosy hostel with an amazing view, superfriendly owners and tidy rooms. 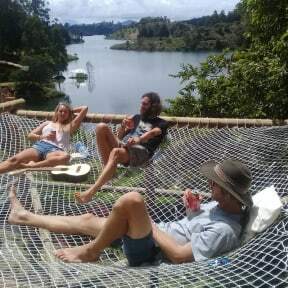 Hostel offers many opportunities to explore Guatape without spending much money. Great hostel with very Friendly owners. A bit out of town but then again close to the piedra. No breakfast so bring your own. Double with bathroom was very spacious and bed was so comfortable. What a lovely couple, it does feel like a home! They socialise with you because they are genuinely interested, not out of politeness. The hostel is not in the city itself, but very close to the rock. We booked an extra night because we loved it so much. Super nice hostel with super friendly staff. Close to the rock. Only thing, it is a bit out of the center; would not call it Guatape. However, in 5 mins you are in the center by Jeep or tuktuk.